Luanne Wright was all set for retirement when the deadliest wildfire in California history swept through her town of Paradise. The blaze incinerated her home, her car and even the chickens in her backyard. Now Wright is spending the days leading up to Christmas with her husband and daughter on adjacent cots in a Red Cross refugee center in nearby Chico, desperately searching for somewhere to live. Her husband is recovering from a heart attack suffered at a previous shelter. 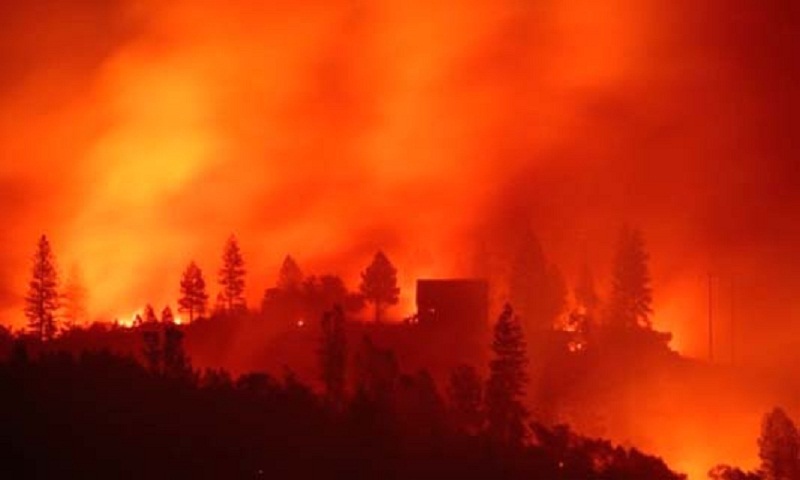 The so-called Camp Fire broke out in early November in Butte County, killing at least 86 people and burning 14,000 homes in the tree-blanketed Sierra Nevada foothills of northern California. Insurance claims have already topped $7 billion, and officials estimate it will cost at least $3 billion just to clear the charred debris of homes and businesses. A few feet away in the Silver Dollar fairgrounds, where about 700 people are living in tents, camper vans and a giant exhibition hall, Rubi Solis watches over four children, four dogs and a cat. Solis didn’t know her estranged husband had stopped paying the insurance premiums months ago on her house in the tiny community of Concow, leaving her without coverage. Her house was worth $200,000. The government gave her $34,900 to rebuild — enough, she says, to just about cover the cost of a new kitchen. Her children have no school to attend. The youngest, aged four, got so stressed she started slurring her words. The Wright and Solis families are among thousands struggling to find housing as winter approaches and they try to piece together their shattered lives. And the months ahead are unlikely to be any easier. A year after wildfires swept through Sonoma County, about 100 miles (160 kilometers) west of Paradise, some survivors there have begun to rebuild. But many still cope with physical losses and psychological scars — when smoke from the Butte County fires reached Sonoma County last month, many people suffered flashbacks or night terrors. Wadner Anilus, a disaster relief program coordinator in Sonoma County, said he sees rising drug abuse and increased school drop-out rates among teen survivors of last year’s fires. Anilus recalled one survivor saying at a group counseling session that she couldn’t wear donated clothing “because it reminded her of the night of the fire.” Two other women at the session started crying and admitted they had the same feelings, but had been too embarrassed to express them. “You just see clients sit in bed for days,” Anilus said, because a year later they’re still overwhelmed. Niveen Rizkalla, a researcher specializing in post-traumatic stress disorder at the University of California, Berkeley, has been working with Sonoma survivors and relief workers for the past year. They spent the weeks immediately after the fires dealing with what she calls “survival needs” such as food, clothing and housing. Only later did they begin to confront their emotional damage. Rizkalla said survivors often suffer suicidal thoughts, and may turn to substance abuse. “People need to escape, they need alcohol, drugs to ease their pain,” she said. Things are even more challenging in Butte County, where the median home value is less than half that of Sonoma, and where many of the poor and elderly did not have house insurance. The quest for normalcy is keenly felt by Trudi Angel, whose home and ballet studio were destroyed in Paradise. Her Northern California Ballet company has presented “The Nutcracker” before Christmas for the past 32 years, and she is determined the show must go on in mid-January. But Angel, a former dancer with ballet companies in Munich, Chicago and Los Angeles, said contributions have come in from as far away as Stuttgart, London and Japan, and a ballet company in Oregon offered its Nutcracker costumes.